Shelby announces it will end limited run of its Shelby GT350 and the last order for the 2013 Shelby GT350 will be taken December 31, 2013. What will the end of production of the 2013 Ford Mustang Shelby GT350 mean for the iconic performance car? Shelby has announced it will end the run for the iconic Shelby GT350 muscle car after this year. That’s the bad news, but the good news is production will continue on all existing models, including the Shelby GTS, GT500 Super Snake and Shelby 1000, Shelby Raptor muscle truck and Shelby Focus ST. But it’s been well-planned out that Shelby will produce the last GT350. Just like Carroll Shelby did in the 1960’s with the 1965, 1966 and 1967 models, Shelby American wanted to build the GT350 in small numbers for 2011, 2012 and 2013. Today, those 60s Shelby Mustangs are the most desirable and collectible muscle cars in the world. Shelby American is hoping the same will hold true for the current generation GT350s. The first 45th anniversary year GT350 was built in 2011 and were all coupes that came in Competition White with Guardsmen Blue stripes that were designed after the first 1965 Shelby models. They added three more colors in 2012, red, blue and anniversary black/gold celebrating 50 years of Shelby American. The convertible was also offered similar to the options offered by Shelby American in 1966. 2013 saw expanded color options, equipment choices and styling changes, to keep with tradition again. Shelby American wanted keep with tradition and build the current generation GT350 to be “light, nimble and powerful.” They used the highly competent Ford 5.0-liter small block engine and every aspect of the car was enhanced to create the ultimate high performance muscle car that is true to the Shelby spirit from the 1960’s era cars. 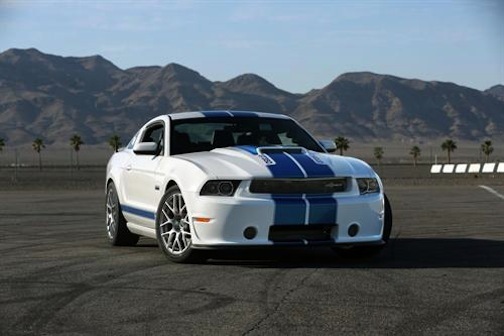 With the new 2015 Ford Mustang on its way, Shelby will no doubt have some good things planned for the new-generation Mustang. We’re not sure what the future will hold for the GT350, but we know Shelby is already making plans for the next model. But customers who want the last 2012-2014 Shelby GT350 models will be able to place orders through the end of 2013.